You already know how important exercise is for all age groups and you've probably heard that yoga is a good choice for seniors, especially those with mobility issues. Yoga can help you lose weight and improves both flexibility and balance, which are two of the biggest challenges seniors face as they age. What you may not know about is all the other benefits yoga can provide. Because it has been practiced for thousands of years there have been plenty of studies to examine exactly what yoga does to improve your health, no matter what stage of life you're in. Since yoga is so beneficial for seniors, physical therapists have developed yoga routines that can be practiced in a chair to help those with mobility issues. Mental: The mental benefits of yoga will quickly improve the overall quality of life. Because yoga improves sleep quality most people see fairly fast results. Yoga has also been shown to be effective in improving depression and is so useful in fighting stress it is considered one of the main treatments for Post Traumatic Stress Disorder (PTSD). Yoga also reduces anxiety and sharpens the mind. Because mental health is so vital to the quality of life it's a good idea to introduce yoga to every day habits. Yoga helps with weight loss, which affects every aspect of a healthy body. Yoga helps minimize hypertension. Although the American Heart Association states more studies need to be done before yoga becomes a standard treatment for hypertension early studies prove very promising and are definitely beneficial. 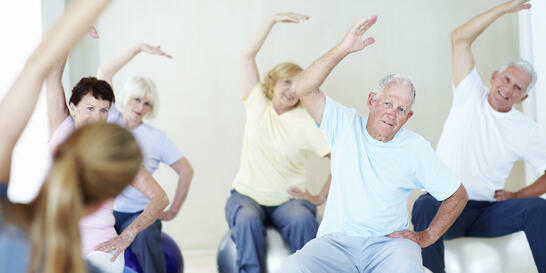 As you can see, yoga is perhaps the best type of exercise regime possible for seniors to practice. It not only improves flexibility but also the mental and physical well being and will improve your quality of life no matter what age you are!